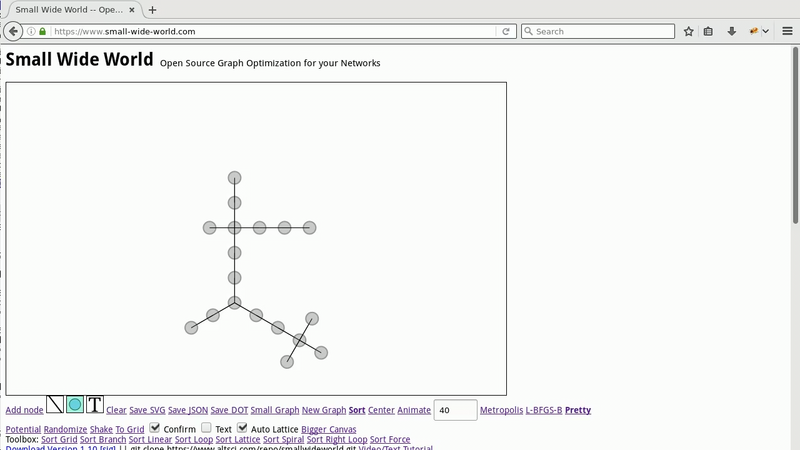 Small Wide World is an open source graph tool that you can use to create and modify graphs. What's a graph? The image below is a graph. If you want a little help, click Animate and it will try to make the distance between nodes the same. Click Add node for each node you want. Drag the nodes to where you want them to be. Drag from the node you want to connect to the other node. A line will form between the two when they are connected. Click Move nodes. Now you can drag them around if you want. Click Animate to improve the shape a little bit. Repeat as many times as you want. Click Save JSON to make a copy so that you can use it once I get the import function working. If you want to continue working on a network you saved, paste the JSON data into the text area above Import and click Import.